I have therefore stopped at the Banat of Temesvár as a relatively peaceful province, with just as many ethnicities and religious denominations as these, but if anything dogged by myths of harmonious ethnic cohabitation rather than the perennial ancient-hatred myth. My new book is not intended to solve bibliographical disputes, count populations or work out who was there first. It is instead a historical meditation on the destructive and creative effect of ebbing and flowing borders on an ethnically variegated population, who lived and died under several waves of imperial rule, under nation-states and under communist and post-communist regimes. I start the story in the medieval period, long before there was a province called the Banat of Temesvár, in the marches of the medieval Hungarian Kingdom, which gave the province its name and borderland character. It was paradoxically the Ottoman conquest of Hungarian territories that merged disparate territories into a bigger unit, the Eyalet of Temesvár, which came to form the blueprint for the later Habsburg province. Habsburg rule from the early 18th century altered the newly conquered territory both economically and demographically. Waves of colonization of mostly (but not solely) German population added to the already rich kaleidoskope of peoples and kick-started the economy of the province. The ups and downs of Habsburg rule in the Banat are followed from the point of view of the main nationalities and confessions: Serbs, Romanians, Hungarians, Jews and Schwaben. The story of the Banat between the 18th and early 20th centuries is the typical history of an imperial province: it follows the transformation of the concept of nation from privileged community to all-encompassing ethnic group; the first flush of parliamentarism and its trials and tribulations; the emergence of citizenship; the fretting over who various communities were and what their place in the Empire should be; and the march to World War I. Most other studies of the Banat either stop at the end of the Great War, when the province ceased to exist, or follow one the splinters of the province (Romanian or Serbian). What this book brings that is new is comparative coverage of the post-1918 period extending to the present day with the arrest of Ratko Mladić in May 2011 in Lazarevo in the Serbian Banat. The book shows what happened in both halves of the Banat, how they evolved in the two different countries, under two different systems; looks at the fate of the Jewish population during the Second World War; that of the German population after the war; explores life under the two communist regimes, respectively the most relaxed and the most draconian in the Eastern bloc, and finally looks at life after Communism and the rebirth of regionalism within the framework of the EU. The book is primarily a reflection on how arbitrary borderlines can make the difference between life and death, prosperity and misery. It is a transnational history highlighting both continuities and discontinuities, showing that frontiers can change people’s lives overnight but cannot easily change who they are and how they feel. Slow, generational change does occur and when it is concluded there is no going back. Freshly drawn borders are like scalpel strokes: they sever living tissue and wrench communities apart. Once healed, however, they create their own normality and shape the people within them in new ways. The trajectory of the Banat of Temesvár as a historical province highlights the paradox of borders, which are, more often than not, out of step with the people: when national frontiers were imposed on the Habsburg imperial borderland, multi-ethnicity was deemed a problem; now when national borders are finally coming into their own and ethnic homogenization is taking place naturally, a new discourse has come into being extolling the virtues of tolerance and harmony in multi-ethnic, multi-cultural communities on both sides of the border. This comes across as an exercise in ‘where are the snows of yesteryear?’ The frontier has in the meantime forged a new reality. Irina Marin is Teaching Fellow in Romanian Literature at UCL-SSEES and College Teaching Fellow in History at Pembroke College, Oxford. She is currently working on a new research project, which examines peasant and anti-Semitic violence and its transference between Tsarist Russia, Romania and Austria-Hungary in the late 19thand early 20th century. 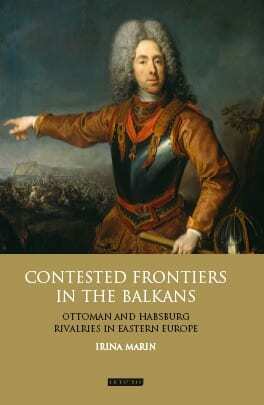 Her book Contested Frontiers in the Balkans: Ottoman and Habsburg Rivalries in Eastern Europe is published by I.B Tauris. I commend you for this wonderful piece of genius. Many are out there whose stories will never see daylight not because they are insignificant to global development, but because the scholarly world focuses its attention on the larger and much-talked-about groups. Your work, like your personality, is distinguished for going behind the lines to unearth a people, their history(ies) and situating these in the global context. You demonstrated that the mighty oaks grew from little acorn. You bring marginality to the discourse on identity, peoplehood and relevance. This, for me, is far more commendable and worthy of emulation than the tons of criticisms others will raise on your work.